Because of Hurricane Irma, the government is temporarily suspending a law prohibiting foreign ships from transporting goods between two U.S. ports. The federal government is trying to make it easier to get gas to areas affected by Hurricane Irma. On Friday, the Department of Homeland Security issued a seven-day waiver of the Jones Act. The 1920 law prohibits foreign ships from transporting any type of cargo between two U.S. ports. With that law temporarily suspended, more ships can help transport gas to areas where the normal oil supply system is disrupted. And gas is a hot commodity. With Hurricane Irma headed straight toward Florida, people have been lining up at gas stations either trying to get out of town or just preparing for the worst. And gas was already facing a shortage due to Hurricane Harvey. That storm forced some refineries along the Gulf Coast to shut down, significantly impacting the country's fuel production. Forecasters expect Irma to make landfall in Florida early Sunday morning. 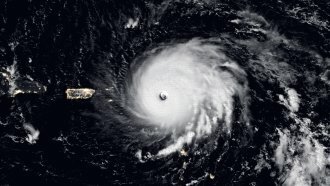 The storm decimated islands in the Caribbean when it made landfall there as a Category 5 hurricane.